A radio play is an audio-only performance that uses multiple actors to tell a story and often includes sound effects and music. What are the parts of a radio play? A radio play is made up of three audio components: the voices of the readers playing the different characters, the mechanical sounds performed by the sound effects crew, and pre-recorded music and background sounds such as crickets and rain. Where can radio plays be used with young people? 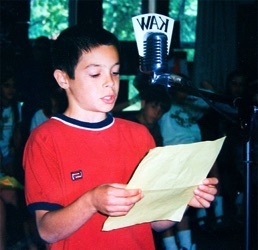 Schools are a natural place for young people to perform radio plays but they can also perform plays as part of summer camps, after-school programs, leadership conferences, church youth groups, children's theater, service learning clubs, scouting groups, etc. It is best to start with a pre-existing script so that your students can gain an appreciation and practical understanding of radio drama as an art form. Later when they've had some experience, they can begin writing and performing their own radio plays. Another good idea is to have them listen to professionally performed radio plays. This can be a vintage radio drama from the 1930s and 40s or a Raven Radio Theater of the Air recording such as The Remarkable Miss Barton or Seven Miles to Freedom. The ten short episodes of Visitor from the Past, which is produced in the style of the early radio cliff-hangers, is also a good choice. What comes with a Raven Radio Script? What is the difference between a “live” performance and a “multi-track” performance? During the early days of radio, all plays were performed “live.” This means that the actors read their parts in real time from beginning to end, one scene after another, while the sound effects crew made sounds at the appropriate moments and the organist or orchestra contributed the music. Occasionally a vinyl record was used to add music and/or background sounds as the performers read their parts. Then in 1953, the Ampex Corporation—with funding from Bing Crosby—came out with the first multi-head tape recorder making it possible to record each component of a radio play or song separately and then to combine these component into a cohesive whole. Almost all professional music and radio advertisements are today produced in this way. Which approach is best with young people, live or multi-track? For recording purposes, multi-track gives the director the greatest control over each component of a radio play and how they fit together. The live performance, however, is much more engaging and exciting for the participants, and for this reason, it is the approach we recommend when working with larger groups of young people. Are there different ways to perform a radio play? A fun and simple way to perform a radio play is to think of it as readers' theater with sound effects. Use the volume knob on a boom-box to fade in and out the theme music and background sounds while some of the students read parts and others make sounds with sound effect devices they've found or made. (Instructions for finding or making sound effect devices come with each play.) Some teachers enhance the “theater of the mind” experience by having the readers and sound effects crew perform behind a suspended blanket. Another option is to perform your play for another class or as a school assembly. Posters can be put up beforehand, secret decoders distributed, and the audience encouraged to applaud at the right moment by someone holding up an “applause” placard. How many students can be in a radio play? Most Raven Radio Theater plays have sufficient characters and mechanical sound effects to accommodate up to thirty students, twenty or so as readers and the rest on sound effects. A couple of shorter plays have fewer characters and sound effects and so require less students. This information is provided with each play on our web site. What grade levels are Raven Radio Theater plays written for? We have scripts for elementary students starting with second grade (The Noisy Night Visitors) up through high school. Appropriate grade levels are listed for each script on our web site. We will be adding additional scripts in the near future. Why are you called The Raven Radio Theater? Among the native peoples of the Pacific Northwest the Raven was known as the trickster. Radio drama is a sort of trickery because with only a few voices and sounds it can fool the imagination into seeing and experiencing an entire world. We think that's pretty cool and the children we've met doing radio drama over the years think so too. By the way, our mascot is named Poe and our call letters are KAW. Does the Raven Radio Theater provide training in the art of radio drama? When I try to purchase two scripts the FREE cookbook doesn't show up in my cart? Yes, this is true but it will show up with your PDF and Mp3 files guaranteed! My digital files didn't come when I place my order? What is Calling Crane Publishing?